Film festivals choose backstage passes to generate excitement and buzz for VIPs while ensuring proper security access. Film festivals are a great way for new and up and coming directors to promote and attract buyers and distributors for their film. Because of the exclusive nature of the films, it’s important to have security measures in place. Some screenings have limited viewing access while others allow the film’s actors, directors, producers and panelists to mingle with the press, media and audience. Security is usually one of the main reasons that festival planners choose to have backstage passes at their events. They also make a great marketing and promotions tool because the film’s artwork and branding, social media handles, hashtags and even the schedule of events can be printed on the passes. Many times, an attendee will use the pass as a keepsake which furthers the film’s messaging and branding even after the festival has concluded. Promotions managers use backstage passes as promotional giveaways at their events. Utilizing QR codes on the backstage passes are a great way to allow attendees access to trailers, videos or to connect to the film’s social media accounts. QR codes can be easily added to the passes to allow for attendee engagement. Backstage passes can be printed using artwork and branding in many different colors, sizes or shapes depending on the needs of the festival. Different access levels can be printed on the passes and our clients are never charged for design modifications. For example, if your festival requires the standard film artwork but different clearances for staff, crew, artist and VIP, all of the passes can be printed with the artwork and different security access levels can be added at no charge. Film postcards are a favorite of promotional managers and can be customized using foil, holographic overlay or other design features to make them stand apart from the crowd. Use a film postcard as a promotional piece for your film that can also double as a business card. Our durable synthetic material will stand up to heat, moisture and can endure a great deal of wear and tear without the worry of the core splitting or lamination peeling. Film postcards can be created using different sizes or shapes to allow for a one-of-a-kind piece. This not only makes for a unique way to promote the film, but having an attractive marketing piece will show that you are passionate about what you are selling. 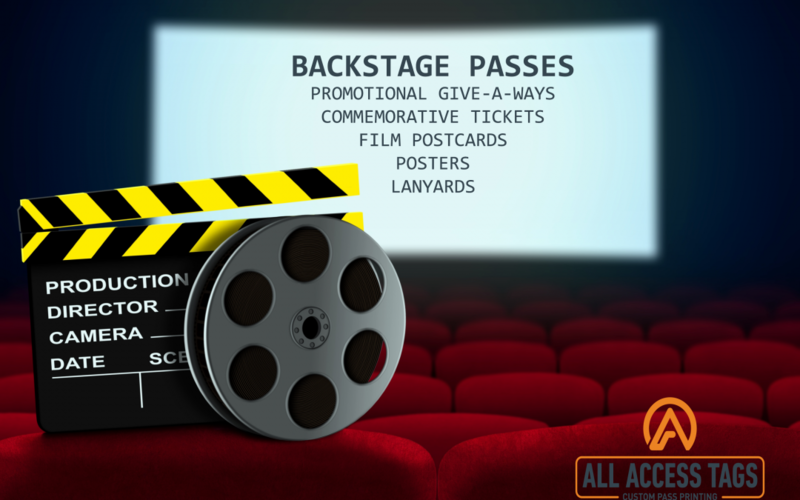 Our staff would be happy to create a package for your upcoming film festival with custom backstage passes, posters, film postcards, commemorative tickets and lanyards. Contact us today to see how we can contribute to the success of your next film festival!